One of a series of Ministry of Information propaganda posters, comparing industrial workers to members of the armed forces. This one paraphrases Lord Nelson's famous signal; "England expects that every man will do his duty". This is a Timeline of the United Kingdom home front during World War II covering Britain 1939–45. For a brief narrative see United Kingdom home front during World War II, as well as History of Scotland#Second World War 1939-45 and History of Northern Ireland#Second World War. For the military story see Military history of the United Kingdom during World War II for foreign affairs, Diplomatic history of World War II,. For the government see Timeline of the first premiership of Winston Churchill. For a narrative history and bibliography of the home front see United Kingdom home front during World War II. The Military Training Act, Britain's first peacetime draft, comes into force. All men aged 20-21 are now liable to call-up for four years military service as 'Militiamen'. Given the worsening situation in Europe, Parliament is recalled and immediately enacts the Emergency Powers (Defence) Act 1939, granting the government special legislative powers for the duration of the crisis. Army reservists are called up. Civil Defence workers are put on alert. Evacuee schoolchildren leave Stepney in London at 5 am on 1 September 1939. The National Defence Companies (a voluntary reserve force of former servicemen) are mobilised to protect "vulnerable points". The Fleet proceeds to its war stations. The Royal Navy is much stronger than Germany's. It has eight battleships versus zero for Germany; seven aircraft carriers versus zero; two battle cruisers versus five; 66 cruisers versus six; 100 destroyers versus 17, 67 submarines versus 57; and a merchant fleet five times larger. In response to the German invasion of Poland and the prospect of war with Germany, plans for the evacuation of children and nursing and expectant mothers from London and other areas deemed vulnerable to German air attack are put into action. The British Army is officially mobilized. Under intense criticism from the House, Neville Chamberlain abandons an offer to negotiate peace terms between Germany and Poland and agrees to present an ultimatum to Hitler. Shortly after 11:00 Chamberlain announces to the nation that his ultimatum has expired and that Britain is at war with Germany. Twenty minutes later the first air raid sirens are sounded in London. They are a false alarm. Chamberlain reforms his Government, creating a small War Cabinet which includes Winston Churchill as First Lord of the Admiralty. The National Service (Armed Forces) Act is passed. All men aged 18-41 are now potentially liable for conscription. The National Registration Act is passed, introducing identity cards. The first war tax is revealed by the Cabinet, including a significant increase in income taxes. Call-Up Proclamation: all men aged 20-21 who have not already done so must apply for registration with the military authorities. With the end of formal Polish resistance the Phoney War begins; It lasts until April 1940. There was little military action, although the Allies (Britain and France) began economic warfare, and shut down the German surface raiders. They created elaborate plans for numerous large-scale operations designed to swiftly and decisively cripple the German war effort. These included opening a French-British front in the Balkans; invading Norway to seize control of the Germany's main source of iron ore; and a strike against the Soviet Union, to cut off its supply of oil to Germany. Only the Norway plan came to fruition, and it was too little too late in April 1940. London schools start to reopen because of evacuee children returning to the capital. A government poster urging mothers not to bring their evacuated children back to vulnerable urban areas. 35% of London schoolchildren had returned from evacuation. Further evacuation of 160,000 children from London and relocation of children who had been settled near vulnerable coastal areas. Winston Churchill gives a series of famous speeches in Parliament: "Blood, toil, tears, and sweat", "We shall fight on the beaches" and "This was their finest hour." The debate on the recent debacle in Norway leads (on 10 May) to Chamberlain's resignation. Germany invades France and the Low Countries, ending the Phony War. Winston Churchill becomes Prime Minister and forms an all-party coalition government. Internment of all German or Austrian males aged between 16 and 60 begins, starting with those living nearest to the south and east coasts. Local Defence Volunteers receive rifle instruction, Surrey 1940. In a BBC radio broadcast Anthony Eden calls for the creation of the Local Defence Volunteers (LDV) militia - renamed on 23 July the Home Guard. The Emergency Powers (Defence) Act 1940 is passed, granting the government even more authority to control persons and property for the duration of the war. Italy declares war on Britain. Italian men aged 17 to 60 are arrested and interned. Large mobs attack Italian businesses and families in London, Liverpool, Belfast, Cardiff, Edinburgh and Glasgow. 25,000 Channel Island refugees arrive in England. German occupation of the Channel Islands begins. A further 60,000 schoolchildren evacuated from London and the Home Counties in the following 12 months. Cardiff is bombed for the first time. Plymouth is bombed for the first time. Official start date of the Battle of Britain. Introduction of Defence Regulation 58AA allowing the Minister of Labour to ban strike action and force compulsory arbitration. No strikes are called by any trade union during the war; there are unofficial short local strikes in coal, shipbuilding and machinery. SS Anselm leaves Liverpool for Halifax, Nova Scotia with the first group of 82 children being evacuated under the Children's Overseas Reception Board (CORB) scheme. First major air raid on central Birmingham. First major air raid on Liverpool. Looking down the River Thames towards the London Docks, 7 September 1940. The German Blitz hits London and other major cities causing death and damage. Official histories concluded that the mental health of a nation may have improved, while panic was a rarity. Prewar dire predictions of mass air-raid neurosis were not borne out. Predictions had underestimated the adaptability and resourcefulness; in addition there were many new civil defense roles that gave a sense of fighting back rather than despair. The highly visible dangerous role gave firemen some of the ideal attributes more commonly associated with the venerated image of the military hero. German bombing raid on South London; formal beginning of London Blitz. SS City of Benares bound for Canada is torpedoed and sunk in the Atlantic; 77 of the 90 evacuee children on board died, resulting in the abandonment of the Children's Overseas Reception Board (CORB) evacuation scheme. Official end date of the Battle of Britain. Coventry Cathedral and the city centre in ruins, 16 November 1940. Massive German bombing raid on Coventry. First major air raid on Bristol. The Communist Daily Worker newspaper is banned. It had ignored a July 1940 warning that its pacifist line contravened Defence Regulation 2D, which made it an offence to 'systematically to publish matter calculated to foment opposition to the prosecution of the war'. When Germany invaded Russia in June 1941, the British Communists became fervent supporters of the war and the ban was lifted. Major air raids destroy most of Clydebank. Londoners shelter from an air raid in an Underground station. Last major attack on London of the 1940-41 Blitz. Civilian clothing is rationed for the first time. The National Service (No. 2) Act is passed. All men and women aged 18-60 are now liable to some form of national service, including military service for those under 51. The first military registration of 18.5-year-olds takes place. The Schedule of Reserved Occupations is abandoned: from now on only individual deferments from the draft will be accepted. First US Army troops arrive in the UK. Disembarking at Belfast, the officers were the advanced party of a force intended to defend Northern Ireland and release British troops for service overseas. The Daily Mirror publishes a controversial cartoon by Philip Zec which Churchill and other senior government figures alleged was damaging to public morale. Zec is investigated by MI5 and the government seriously proposes banning the newspaper until parliamentary opposition forces a retreat. 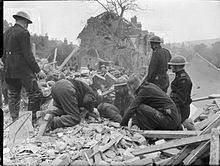 Beginning of so-called Baedeker Blitz on English provincial towns, mainly chosen for their historic and cultural significance; Exeter, Bath, Canterbury, Lincoln and York along with several coastal towns were targeted. Attacks continue sporadically until 6 June. The basic civilian petrol ration was abolished, making fuel unavailable to private car owners. Church bells were rung all over the United Kingdom for the first time since May 1940, in celebration of victory at the Second Battle of El Alamein. Sir William Beveridge's Report on Social Insurance and Allied Services published. The Ministry of Labour reports that 1942 strikes cost 1,527,000 working days, as compared with 1,079,000 in 1941. The House of Commons votes, 335 to 119, against a Labour amendment demanding the creation of a Social Security Ministry and immediate implementation of the Beveridge report. The government has approved the plan "in principle" but called for a delay until the war is over. The Labour Party National Executive Committee rejects the Communist Party's application for affiliation saying it must carry out decisions of the Comintern in Moscow, that it has shown "complete irresponsibility in British politics" and because "its general outlook is entirely out of harmony with the philosophy and objectives of the Labour Party." The Government releases a White Paper by John Maynard Keynes, announcing its post-war currency stabilization plan designed to provide an international banking system. The Chancellor of the Exchequer presents a budget of £5.8 billion with 56% to be raised from current revenue; the deficit would be £2.8 billion of which £2.2 will be borrowed at home. A recruitment poster for men to work in coal mining. The shortage of miners was solved from December 1943 by conscripts being chosen by ballot to be Bevin Boys. Labour Minister Ernest Bevin announces that women from 19 to 50 will be called for work in plane and munitions plants. Men eligible for military service may choose work in coal mines. The Ministry of Health reports that 1942 births totaled 654,039 versus 480,137 in 1941; deaths 66,811 versus 55,043. Infant mortality was 49 per 1,000, the lowest on record for Britain. The first of first of 33 fortnightly ballot draws for the compulsory recruitment of men for coal mining, who would otherwise have been conscripted into the Armed Forces. These recruits would become known as "Bevin Boys". Villages in the South Hams area of Devon were compulsorily evacuated to create a training area for the planned D-Day landings. Also evacuated were the villages of Imber in Wiltshire and Tyneham in Dorset. The inhabitants of the last two have never been allowed to return. Start of Operation Steinbock or the "Baby Blitz", a Luftwaffe night bombing campaign against southern England, which continued until May 1944. R.A. Butler's Education Act passed, reorganizing Britain's school system under the tripartite system. First V-1 flying bomb attack on London. Civil Defence rescue teams search a large pile of rubble following a V-1 flying bomb attack in Upper Norwood, London. Final wave of evacuation (codenamed "Rivulet") of children from London to the English Midlands and West Country. First V-2 rocket attack on London. The Blackout is replaced by a partial 'dim-out'. Ernest Bevin announces the government's plan for eventual military demobilization. The Home Guard is stood down. Part-time members of the National Fire Service are stood down. Last V-2 attack on London. Last V-1 flying bomb attack on London. Civil Defence Service is stood down. 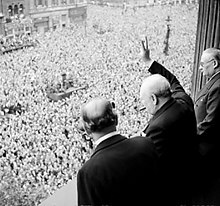 Churchill waves to crowds in Whitehall on Victory in Europe Day, 8 May 1945. Liberation of the German-occupied Channel Islands takes place. The Labour Party members of the coalition government resign in order to prepare for the upcoming general election. Churchill appoints a largely Conservative caretaker government. The Family Allowances Act passed. Mothers will receive a tax-free cash payment for each child in their care. This is the first time in Britain that a state payment has gone directly to a wife rather than her husband. Demobilisation of the armed forces begins. Demobilised troops disembark at Dover, 1945. General election voting takes place in the UK. The ballots are then sealed for three weeks to allow the collection and counting of overseas service votes. The Labour Party wins the general election with a historic landslide. Clement Attlee becomes Prime Minister and forms a new government. ^ The main sources here are Facts on file yearbook (compilation of weekly reports) and Keesing's Contemporary Archives (monthly reports), both online. ^ Daniel Todman, Britain's War: 1937-1941 (2016) p 213. ^ Talbot Charles Imlay, "A reassessment of Anglo-French strategy during the Phony War, 1939-1940." English Historical Review 119#481 (2004): 333-372. ^ a b c d e "Information Leaflet Number 32 - The evacuation of children from the County of London during the Second World War" (PDF). cityoflondon.gov.uk/. London Metropolitan Archives. November 1997. Archived from the original (PDF) on 2013-09-06. ^ Lori Maguire, "'We Shall Fight': A Rhetorical Analysis of Churchill's Famous Speech." Rhetoric & Public Affairs 17.2 (2014): 255-286. ^ Mike Wells and Nicholas Fellows (2015). OCR A Level History: Britain 1930-1997. pp. 49–55. ISBN 9781471837302. ^ Dropkin, Greg (29 May 2003). "Strikes during wartime". www.labournet.net. Retrieved 13 March 2015. ^ Edgar Jones, et al. "Civilian morale during the Second World War: Responses to air raids re-examined." Social History of Medicine 17.3 (2004): 463-479. ^ Linsey Robb, "‘The Front Line’: Firefighting in British Culture, 1939–1945." Contemporary British History 29.2 (2015): 179-198. ^ Philip M. Taylor (2003). Munitions of the Mind: A History of Propaganda, Third Edition. p. 214. ISBN 9780719067679. ^ "American Forces in Northern Ireland". www.secondworldwarni.org. Retrieved 20 February 2015. ^ Taylor, Warwick H. "Bevin Boys Association" (PDF). seniorsnetwork.co.uk/bevinboys/index.htm. Retrieved 15 February 2015. ^ a b Essex-Lopresti, Tim; Woolven, Robin (2005). "A Brief History of Civil Defence" (PDF). www.civildefenceassociation.org.uk. Civil Defence Association. Retrieved 6 February 2015. Addison, Paul. "The Impact of the Second World War," in Paul Addison and Harriet Jones, eds. A Companion to Contemporary Britain: 1939-2000 (2005) pp 3–22. Addison, Paul. The road to 1945: British politics and the Second World War (1975; 2nd ed. 2011). Addison, Paul. Churchill on the Home Front, 1900-1955 (1992) ch 10-11. Jones, Helen (2006). British civilians in the front line: air raids, productivity and wartime culture, 1939-45. Manchester University Press. ISBN 978-0-7190-7290-1. Levine, Joshua. The Secret History of the Blitz (2015). Marwick, Arthur. The Home Front: The British and the Second World War. (1976). Short, Brian. The Battle of the Fields: Rural Community and Authority in Britain during the Second World War (2014). This page was last edited on 31 March 2019, at 05:04 (UTC).